General Motors says the 2014 Corvette Stingray zooms from 0 to 60 mph in 3.8 seconds. At right above, the small steering wheel is meant to give the driver a more precise feel. MONTEREY, Calif. -- Chevrolet's 2014 Corvette Stingray is improved from the outgoing sixth-generation car by every major measurement: It's faster, more powerful, more refined and more fuel efficient, and has a much better interior. But it is the sports car's edgy exterior styling -- "futuristic," "exotic" and "more international" were descriptions used here by Corvette designers during a test drive for the automotive press -- that General Motors is counting on to cultivate a new breed of Corvette loyalists. The seventh iteration of the sports car introduced 60 years ago should solidify the Corvette's status as an attainable dream car. At $51,995 for the coupe, including shipping, the car matches the performance credentials of peers that are priced two or three times higher. The price is up $1,400 from that of the current comparable model. The basics: The new aluminum frame is 100 pounds lighter and 57 percent stiffer than the steel frame that underpins the 2013 base and Grand Sport models. That extra stiffness, along with a magnetic-based damping system and a new electronic limited slip differential, kept the Corvette sure-footed even at high speeds on the pebble-strewn roads that snake through this area's coastal mountain range. Under the carbon fiber hood is a new 6.2-liter V-8 engine that produces 455 hp and 460 pounds-feet of torque. In a first for the Corvette, the car features cylinder deactivation, which cuts fuel to four of the cylinders under light loads. The technology, used on GM's full-sized pickups since 2007, helps the car get 29 mpg on the highway, up from 26 mpg on the outgoing model. The engine is teamed with a seven-speed manual gearbox with what GM calls Active Rev Match, which anticipates gear changes for smoother shifts. It's also available with a six-speed paddle-shift automatic transmission. The car scoots from 0 to 60 in 3.8 seconds, GM says. Stomping on the throttle of a Z51 performance model with an automatic transmission produced a 4.2-second reading on the digital 0-to-60 readout on the instrument panel. A smaller steering wheel -- the smallest GM has ever used in a production vehicle -- is meant to give the driver more precise feel. Notable features: The car has five drive modes that are selected with a knob on the console: "Tour" is the default setting; "Weather" offers better stability in rain and snow; "Eco" maximizes fuel efficiency; "Sport" dials in more precise steering for carving twisty roads and electronically adjusts the exhaust valves for a throatier growl; and "Track" offers Sport features plus torque reduction and brake intervention for competitive driving. 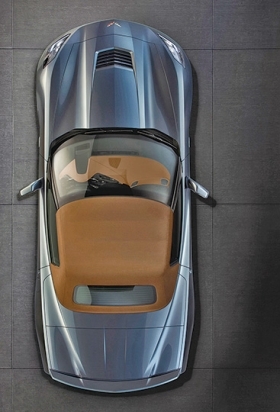 The most striking improvements come on the interior, long panned even by Vette loyalists. The cockpit style cabin is awash in soft-touch materials, even in the base model. A high-definition 8-inch touchscreen in the center stack features Chevy's fairly intuitive MyLink infotainment system. It's matched by a second 8-inch screen in the instrument panel that displays 69 different readings, a lap timer, tire-tread temperature and shift lights that give gear-change notifications at high speeds. Both screens show bright and crisp, even in bright sunlight. To address another common gripe of Vette owners, GM made the seat frames of magnesium, rather than steel, which renders them more rigid and supportive. Competitive sport seats that add side bolstering for more aggressive driving will be available later this year. A smaller steering wheel -- the smallest GM has ever used in a production vehicle -- is meant to give the driver more precise feel. 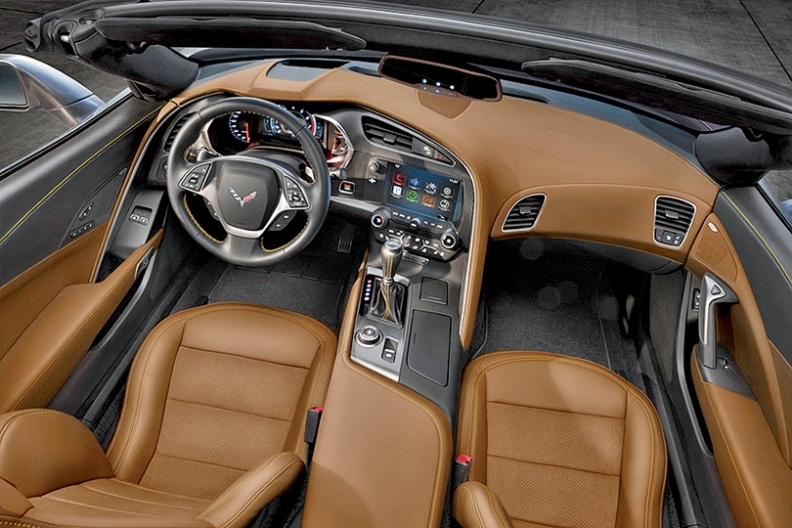 Other interior features that are new to the Corvette include a hidden storage compartment behind the infotainment touch screen, aluminum and carbon fiber accents, and a grab bar on the center console for the passenger. At $51,995 for the coupe, including shipping, the car matches the performance credentials of peers that are priced two or three times higher. What Chevy says: "We've been able to increase the bandwidth of the car," says Tadge Juechter, Corvette chief engineer. "It's more powerful and yet more fuel efficient. The seats are more comfortable, yet provide more lateral support. This car does everything better." Shortcomings and compromises: The configurable gauge cluster can be confusing -- even dizzying -- for the average driver who might not care about tire-tread temperature. A few squeaks and rattles were noticeable inside the otherwise relatively hushed cabin of the preproduction models used for the test drive. The market: GM considers the Porsche 911 to be the Corvette's closest competitor. Last year GM sold 14,132 Corvettes in the United States, compared with sales of 8,528 for the 911. Industry forecaster IHS Automotive expects a strong reception for the Stingray, with U.S. sales of 6,000 units for the 2014 model this year, which will represent about three months of sales. Next year, Chevy says, sales should jump to around 23,000, which would be the highest for the Corvette since 2008. The skinny: The Corvette Stingray's whiz-bang technology and performance gains, without the price jump some might have expected, should keep loyalists in the fold. But it remains to be seen whether the new design will help draw younger buyers or help GM finally gain a foothold for the Corvette in Europe and other overseas markets.